My very first thought was- I wonder if I can pretend that THOSE are MY legs. But I think even liberal references to photoshopping wouldn’t work- damn you reality! I really really really want legs like Stacie! My second thought was about how very personal this discussion would be. While in Western society- the question ‘who are you’ is a chance to delve into deep philosophical questions about our humanity, the equivalent question in Samoan, ‘o ai oe’ can be a deep insult and a challenge. Because we are all supposed to know anyone who is anyone, and all of their ancestors, way, way, way back to Tagaloa. Speaking about my malu, will answer that question, which in Samoa can be so taboo to ask- it will tell you who I am. When I was 16 I wanted a malu. I didn’t think they were particularly beautiful (probably because I didn’t have legs like Stacie). But (like every Samoan) I was well aware of my bloodlines and felt it was my birthright. My parents thought I would feel differently when I got older. They said 'ah but you want to be a lawyer and that is a very conservative profession’. My mum worried about how it might affect my ability to wear minis and my dad warned me about the gang affiliations of tattoos in the West. Of course I obeyed- in Samoa we don’t rebel- we just get musu (this is where you are rebelling quietly to yourself so you don’t feel that salu lima). So over a decade later, when I was living in Australia, working in that conservative profession and occasionally flaunting my vae taamu (for the palagis, I just compared my legs to a particularly thick root crop), when my cousins called to tell me they were having their tatau done, despite not having any money or holiday time, I was on the very next plane to Samoa. Why was I so eager to feel the bite of the 'au? Especially given the pain is legendary and it leaves you with bruises like these. Perhaps it was because even after all this time overseas, I realised that it was the values of my culture ingrained so deeply in me, that had empowered and enabled me to succeed so far from the shores of Samoa. The Samoan culture I grew up with is fiery. There is a passion and a power in excelling and in being the best. This was always expected of me. Particularly academically. The way you achieved reflected not only on you, but on your entire family. Some of you may not know this but Samoans are well known, especially across the Pacific for being just a bit arrogant. I think that is because the pride we take in ourselves is not individual, it is pride in who we are as a collective, as part of a family, as a reflection of something much bigger than ourselves. The culture I grew up with was feminist. It was the type of feminism that didn’t name or declare itself loudly- it just was. Both men and women can become matai or chiefs. And we treat in-laws who stay with the family- nofo tane and fai ava- with equal disdain whether they are men or women. In my own family, my Grandma ruled supreme. She didn’t need an iron fist- she had razor intellect and was known to promptly put anyone in their place (though since I never saw anyone actually disagree with her- I never actually witnessed that. In Samoan culture, people take the first name of their father as their last name- this makes it easier to ‘tala le gafa’ or tell genealogies. My father took his mother's and his father's first names. It wasn’t a statement- it was just who he was. I was brought up believing that I could do anything that my brothers could- though I did feign female weakness when it came to taking out the rubbish. I always felt my culture valued me as a woman. This was encapsulated in the concept of feagaiga- the sacred relationship between a brother and sister. In Samoan we say- 'o le tuafafine o le ioimata o lana tuagage'- a sister is the very pupil of her brother’s eye- she is the centre of his being. It is my brother’s duty to protect and look after me, it is my duty to guide them. In the distribution of gifts and titles, mine will be the final say among my brothers, as my grandma’s was the final say among hers. A sister has traditional spiritual power. It is this most special of relationships that is signified by the stars of the malu. It signifies that a sister is a guiding light to navigate by. And woe be to the brother who invokes his sisters curse- you’ve read about telesa powers so you might be able to imagine…. All over the world I have been stopped in the street and asked about the symbolism of my malu. I am proud to explain how the vaeali- the feet of the head rest- symbolise that it is on the service of the untitled that the chiefs heads rest. That the pattern with the intersecting lines represents the intersection between the matai- the chiefs, the aumaga- the untitled mens group and the aualuma, the young womens group led by the taupou. That the aveau, the starfish represents aiga, family and the central role that family plays in our culture. And that the malu itself, the centre of the entire design, the diamond, represents being protected and to protect. That a woman is the protecter of bloodlines and of knowledge and the bearer of children. So while 16 year old me wanted a malu, I’m glad I waited till I was 27- till I could reflect on what my malu really meant to me. It is more than a birthright, for me it signifies my culture and all of its fire, feagaiga, and feminism. 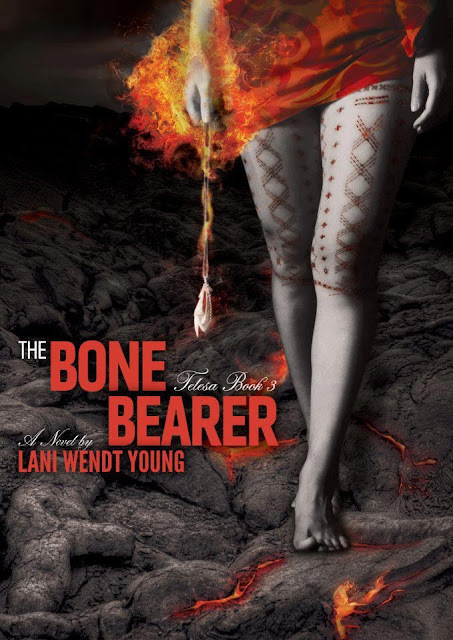 *I was very grateful to the amazing Lani Wendt-Young and Griffith University (the lovely Glenda Stanley) for inviting me to speak for 5 minutes at the Brisbane launch of 'The Bone Bearer' about my journey in getting the malu. The above are the short speaking notes for the presentation I gave. While these notes are about my journey with my malu, I want to write a short postscript about Lani's journey. One of the things I have really admired most about her journey is how all along it, Lani has encouraged and empowered so many other people. While writing her books, I have watched from afar as she has encouraged artists, photographers, models, dancers, poets, comedians (take a bow fabulously funny Gau Siaki) and fellow bloggers and writers. In turn, all these myriad of people have supported Lani. It has been a real lesson in the power of positivity. It has been my great privilege to be one of those people to have been encouraged by Lani, and to have been able to give back in this smallest of ways. I agree. Lani has inspired a new wave of creativity among our PI folk. Wonderful presentation about your malu. I enjoyed it. Thank you- it's always hard to gage how you did especially when worried your dress is riding up to places the malu doesn't even cover! Lol! So it's really great to get feedback. It was such a fun night! I wish other girls would wait until they gain that same maturity before going under the 'au. Great presentation! LOL no you're right there...I feel the same lol. It just hurts me seeing these 16yr olds parading around in them, with no clue what it even means! Thanks for this post - I do appreciate how you highlight the feminist aspects, and your versing of Samaon proverbs, particularly the one regarding brothers, and sisters(being I am the only girl of 4 children). I sought permission from the matai in my family before I decided I wanted a malu. I am turning 30 this year, and will still wait until I feel it is right.